As our description screams and says “never-seen-before” content we bought another on for your followers. 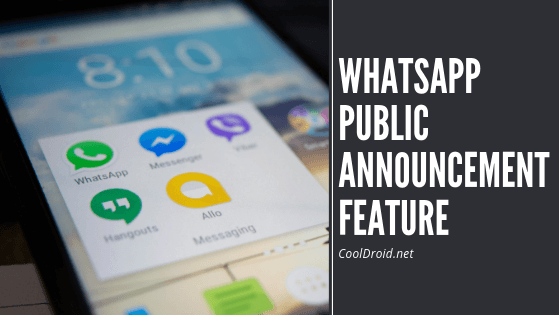 Title reads “WhatsApp Public Announcements : What it is & How to enable it” ,in this we will tell you about WhatsApp’s newly added feature that will allow WhatsApp Developers to send message to thier 100 Million Users! Yeah , WhatsApp have a user base of over 100 Million users and their are implementing this feature to directly contact their users in case of any public announcement , new feature launch or any T’n’C Update. Seems like Mark is doing good for WhatsApp. Enough with it , now come the part how to enable it. This feature is added in the betas above 2.16.240 , there aren’t any mods (unofficial clients with extra features) present at the moment so we will use Stock WhatsApp. Before Beginning : This procedure works only with Android , I must say ROOTED Android. If you don’t know what root is and how to root click me. 2. Now Install all of those APKs , if you face any message like *Installation Blocked* simply go to Setting>Security and Check the *Unknown Sources*. 3. Force Close WhatsApp , this step is very crucial or this trick will not work. Go to your app drawer , select and hold WhatsApp , drag it to App info and *Force Stop* the app. 4. Open Apk Editor Pro > Select Apk From App > WhatsApp > Edit Data [ROOT]. At this moment your Root Management App will ask to grant or deny the root privilege. Just grant it and follow next step. 5. Select Database from the bottom navigation bar. Then msgstore>chat_list and open the top most item from the list. 6. Open the key_remote_jid , it will give a field space for editing in popup. Enter the below code without any spaces or “. 7. That’s Almost It. Open Your WhatsApp & Boom Boom – You can see that Your Conversion will be with WhatsApp Official! Enjoy. NOTE – As you are replacing your friend’s jabber id with official WhatsApp’s , there is a high chance you may lose your texts with your friend. Comment Down if you face any problem.